Flipping Our 1953 22′ Shepherd Sportsman! OMG! Even with her 331 cubic inch Hemi V8 out of her hull and on a cradle, this 1953 22’ Shepherd Sportsman hull (22-53-308) weighs something like 3,500 pounds, and possibly more. Our chain falls and rolling infrastructure is rated for 10 tons, so lifting her is not the challenge. Given her volume, however, three guys must somehow roll her 180 degrees. Here is how we got there. We quickly realized that rolling her to port was driving the aft strap off the roller, so we reversed course and began flipping her to starboard. There is a moment of truth, just as the hull is hanging on edge – on one of the gunwales – in the straps. It still wants to come back, and we must overcome those forces and literally get the uppermost gunwale past the tipping point. Usually we can muscle it through this point, but, as is clear in the clip, the Shepherd easily resisted all we could muster, even when RJ is hanging on the hull. As John can be heard worrying, setting her lower gunwale on the ground and allowing gravity to become our friend offers a solution, but one that risks distorting the hull or worse. These hulls are not designed to carry their weight over one small area of a gunwale. Our strategy, as is evident in the clip was to slowly lower her until she began to roll past the tipping point. The straps continue carrying most of her weight, and the two-inch blue board cushions the wood. Slowly, slowly, slowly over she came, quickly evidencing one main advantage of this strategy: We could control the amount and rate of roll. Finally, over she goes, and momentarily threatens to keep going, but we catch her and settle her on the aft dolly, at which point all the tension leaves the room. Next comes stripping all of the bottom paint and releasing all of the outer bottom planking, which appears to be in great shape and savable. 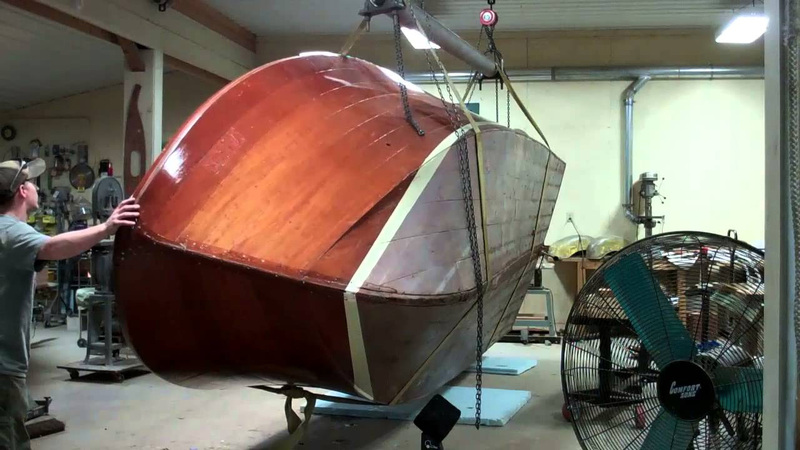 The inner planking will be another story given the many, many months she hung in her boathouse with her bilge full of water. Once all the planking is released and we repair framing as needed, a new true 5200 bottom will be installed.